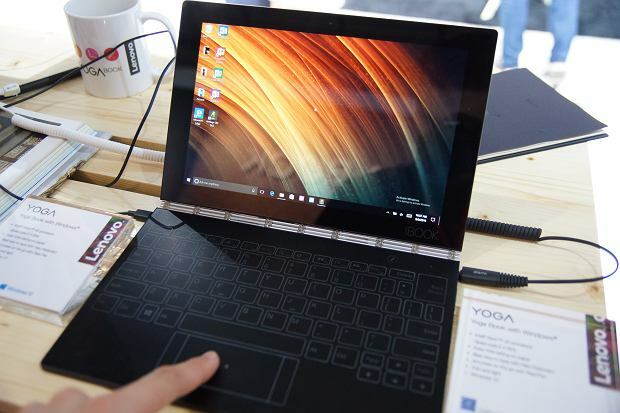 Lenovo Yoga Book is a hybrid laptop, in which the screen is rotated 360 degrees. This solution is well-known from other computers in the series Lenovo Yoga. 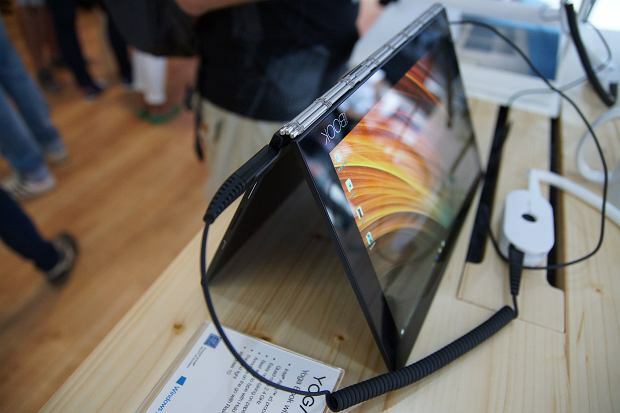 It can act as a traditional laptop, or – after rotating the screen – as a tablet. Model Book, however, differs from other hybrid devices-one “detail “- does not have a physical keyboard. Instead, it has a touch screen, which displays keys. The solution was called “Halo Keyboard”. It provides the ability to write by hand. This is certainly a bold move and it would seem that consumers are not willing to forgo a physical keyboard. At IFA we learned, however, from the employees of Lenovo, the hardware is dedicated to those who appreciate more than the handwriting on the keyboard. How does it work in practice? Yoga Book a button, select the operating mode. After pressing the touch plate ceases to display keys, leaving a smooth, black panel. Now just put it on any piece of paper and you write by hand the supplied stylus (ink). Everything that is written on paper, is immediately displayed on the screen. This way you can make handwritten notes on your computer is not using the touch screen, which would be inconvenient. In the absence of a sheet of paper, it is the possibility of handwriting using a stylus cartridge not having ink. 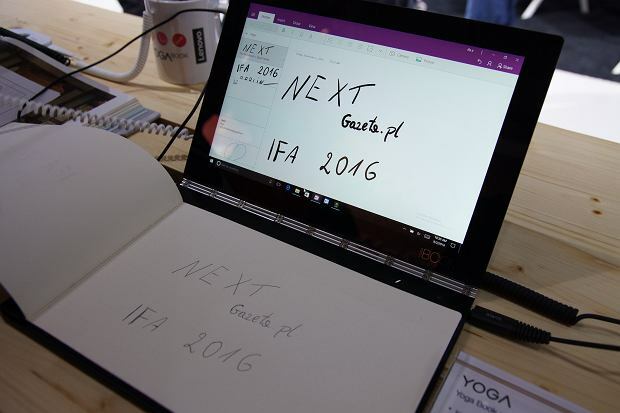 We had the opportunity to spend a few moments with Yoga Book, and we can say that handwriting here is really convenient. Especially if you have to take notes on paper saving a copy of them on the tablet. Additionally, you can use a notepad with a magnetic cover that “sticks” to the touch panel and does not allow notices to slide across the screen. Quite a different look to write the displayed keyboard. In this case, you can not talk about any comfort. It’s like a little typing on the virtual keyboard tablet. The keys are non-palpable and can be rather forget about writing eyes-free. An Inconvenient keyboard is not a disadvantage of this device, because it is dedicated to those who give priority to the handwriting or drawing. “Halo Keyboard” is only an addition, which can be used occasionally. This solution introduces a variety that also looks very interesting. 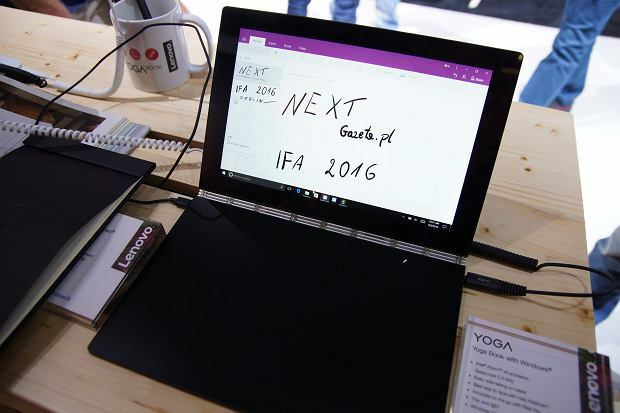 Lenovo Yoga Book is powered by Intel Atom x5-Z8550. There we have 4 GB of RAM and 64 GB of internal memory. But we can help microSD card with a maximum capacity of 128 GB. For displaying an image corresponding to a screen size of 10.1 inches and a resolution of Full HD. The battery has a capacity of 8500 mAh and should last up to 15 hours of operation. Very good impressed on us the dimensions and weight of the device. It is quite small, very slim (less than 1 cm thick) and lightweight. Keeping such equipment on your lap, even for a long time will not be tiring. There are two operating systems: Android and Windows 10. Version with Google on the European market will cost 499 euros, and on the version of Microsoft OS I will have to spend 599 euros.